Kotetsu figure by Megahouse released! Title: G.E.M. Series Tiger & Bunny Barnaby Brooks Jr.
I’m not as excited by Bunny but he does have his trademark tsuntsun face and an extra head without his glasses. Woohoo~ I think they can be stripped! XD But I’m not too keen on amputating Bunny’s legs due to the boots (which seems to be similar to my Chun Li RAH). I hope he does have a pair of proper feet and not just a pair of boots orz;; Kotetsu’s feet looks safe though. There’s also their heroes suits version and they have led lights that glow :D But 25,000 Yen for each… It’s a big -NO- for me. Wishlisted but I’m sure fans will snap them up. I’ll be content with their Figuarts, albeit the much smaller size. Check out the official site of Figuarts for more updates! Update! Kotetsu looking cute and awesome in his chibi figure form! Managed to snag myself one ojisan! :D Also available for pre-order, casual wear Tiger and Bunny figures will be exclusive items sold only at Bandai’s online store. The good news is that they will be made-to-order and each person can order up to 24 pieces. 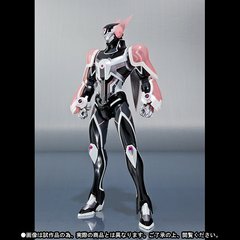 Barnaby Brooks Jr. Figuarts ZERO PVC is up for preorder! Title: Figuarts ZERO Barnaby Brooks Jr. PVC figure フィギュアーツZERO バーナビー・ブルックスJr. Availability: June 2012. Store exclusive and made-to-order, so if you must have it, then don’t miss it! Availability: April 2012. Store exclusive and made-to-order, so if you must have it, then don’t miss it! It works out to approximately the same as if you go through a proxy. These guys are looking very good! The series takes place in a fictional, re-imagined version of New York City called Sternbild City, where 45 years before, individuals with superpowers called “NEXT” started appearing and some of them became superheroes. Each of a city’s most famous superheroes work for a sponsor company and their uniforms also contain advertising for real-life companies. Their heroic activity is broadcast on the popular television show “Hero TV”, where they accumulate points by each feat accomplished and the best ranked hero of the season is crowned “King of Heroes”. The story mainly focuses on veteran hero Kotetsu T. Kaburagi aka Wild Tiger who is assigned with a new partner, a young man named Barnaby Brooks Jr. However, Barnaby and Kotetsu usually have trouble working together as they have conflicting opinions on how a superhero should act. This is one of my favourite animes from the last season. Besides fast-paced, action-packed animation characteristic of Sunrise’s works, the plot is engaging and entertaining. There are colourful personalities with interesting backstories and refreshing villians and side characters. And having Yusa Kouji voicing one of the good/bad guys is an icing on the cake for me. The Kotetsu x Barnaby (reversible) pairing is also very popular among the fujoshi and BL mangaka. Thanks to the BL fan-service in the anime lol. Figuarts are planning to release the whole series of characters from the anime. Fortunately I’m not aiming to collect all of them ^^;; maybe only the ones of Kotetsu and Barnaby if they look good. The first two mecha suit releases of Tiger and Bunny (right) were snapped up in a flash.I would like to get those two on the left, so I’ll be watching their release closely. 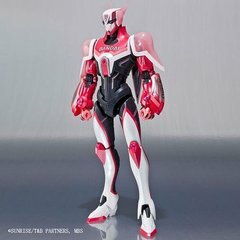 Update: For those who missed out preordering Tiger’s mecha, they’re now bundling him with the character setting guide. Release dates for some of the other figures are not announced yet. I’m quite sure we can buy most of them from usual online hobby stores but they’ll probably sell out fast. And not to forget, these cute goods of the characters in chibi form <3 Rubber keyholders. And of course the evil Animate Japan exclusive Blu-Ray DVD tokuten Deformation chibis. Preorders are already sold out.